Game fishing is the term used to describe fishing in fresh water for salmon and trout. Many of the lakes, reservoirs and rivers that hold game fish are set in beautiful environments and the thrill of that first catch is never forgotten. Before going fishing, the angler must buy a rod licence. This can be obtained from post offices or a licence can also be purchased online by visiting the Environment Agency's website. There are two methods for game fishing and these are fly-fishing and bait fishing. Fly-fishing requires special equipment and the technique of fly-casting needs plenty of practise and experience. For the novice angler bait fishing is the recommended method. The tackle does not necessarily have to be expensive or complicated. Although a bit more sophistication than a bent pin and worm is needed to land a game fish. Here is the basic tackle to get you started: rod, reel, line, floats, split-shot, hooks and bait. 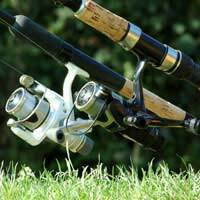 Most towns have a fishing shop or Anglers' Centre where you can select your tackle. The owners are usually keen anglers and can offer advice and guidance when choosing equipment. It's really in their interest to be helpful; after all, they want you to be a regular customer. They can also tell you where you are allowed to fish. Okay, you've had to buy a rod licence and that gives you the right to use a rod and line. However, the licence does not give you the right to fish. The majority of rivers and still waters are owned and controlled by fishing clubs, associations or private estates. These organisations regularly stock their water. They monitor pollution and sometimes guard against poachers. Joining a fishing club will allow you access to good game fishing but there could be a long waiting list to join and it could be expensive, especially if the water has salmon. Also, after a few visits you may decide fishing is not for you. The best option is to buy a day ticket from a fishing club or visit a lake or reservoir where daily and weekly permits are available. Tackle shops and Tourist Information Centres can provide addresses and information. You've bought the licence and basic tackle. You've found a place where you are allowed to fish. The final and probably the most important item is the bait. There are lots of different types of bait for game fishing, but for those starting the sport, worms or maggots are a good choice. (Although some still waters do not permit the use of maggots.) Look under stones or dig in soil for lobworms. A compost heap is where redworms live and a bunch of these on a hook is a favoured bait for many game anglers. Worms will remain fresh if covered with damp soil or moss. Maggots are readily available at tackle shops and are cheap and easy to use. It's important to remember that salmon and trout are wild creatures and have an inbuilt instinct to survive. Approach the water with stealth because fish become alarmed by vibrations. Don't be a stark profile at the water's edge but instead crouch or sit and blend into the environment. Finally, be patient. There are occasions when the first cast will produce a fish and there are times when angling can be a bit of a waiting game.